BANGKOK – Opium cultivation in South-east Asia has doubled over the last six years as growing demand for heroin in China and the rest of Asia lures more farmers to grow poppies, the UN said on Wednesday. Opiate users in East Asia and the Pacific now account for about a quarter of the world total, the UN Office on Drugs and Crime said in a report. China alone has more than a million registered heroin users, and consumes most of the drug in the region, it said. With prices rising, cultivation in Laos soared 66 per cent to 6,800 hectares in 2012, and by 17 per cent to 51,000 ha in Myanmar, the world’s second largest producer after Afghanistan, according to UN estimates. “Overall, opium poppy cultivation in the region has thus doubled since 2006,” despite officials reports from Laos, Myanmar and Thailand that nearly 25,000 ha of poppies were eradicated in 2012, the report said. The study estimates opium produced by Laos and Myanmar to be worth US$431 million (S$526 million) in 2012, a third more than the previous year. Farm-gate prices per kilogram reached US$1,800 in Laos amid scarce supply, and US$520 in Myanmar. The number of people engaged in cultivation has risen in parallel with up to 38,000 “opium growing households” in communist Laos and 300,000 in Myanmar. The rise indicates Myanmar farmers – mainly in northeastern Shan state – will only turn away from opium cultivation if alternative livelihoods are available, the report said. “Farmers are very vulnerable to losses in income derived from opium, especially those who depend on such an income source for food security,” it said. “Furthermore, opium cultivation is generally linked to the absence of peace and security, which indicates the need for both political and economic solutions,” it added, referring to conflict in opium-producing Kachin state. Myanmar has followed a 15-year-plan to eradicate opium by 2014, but the UN study, which used satellite, helicopter and ground surveys, suggests the target is falling away. There is nothing wrong with opium cultivation, it is also a drug with medical values so instead of allowing it to be supplied to drug addicts, the government should step in to control this lucrative trade by only supplying it to medical companies for the manufacture of drugs, if it goes underground, many people will suffer and there will be no end to crime, so the UN should step in to train the farmers on these benefits, once there is a ready buyer ie government and medical companies, the farmers will have no reason to go underground. WASHINGTON: Locating the nearest emergency shelter or chatting live with forecasters — social networks were abuzz with the latest news, tips and reassurance on Sunday as Americans hunkered down for Hurricane Sandy. The massive storm, which has already killed at least 66 people in the Caribbean, is expected to pummel large swathes of the US East Coast, leading authorities to order evacuations and halt public transport in some areas. On Twitter, #Sandy was one of the top trending topics in cities and areas on the predicted pathway of the storm as nervous residents looked for the latest news and posted links to useful websites on how to stay safe. Google set up an interactive map that tracks the path of the storm, provides real-time precipitation figures in areas already hit by the outer edges of Sandy and locates the user’s nearest active emergency shelter. The map also enables people to locate webcams already set up in affected areas to watch as the storm unfolds, as well as videos posted on YouTube showing the situation in various locations, including images of choppy seas or flooding. AccuWeather.com, the weather forecast website, set up a Google+ Hangout — a group video chat — inviting netizens to join and get their questions about the hurricane answered in real time by their meteorologists. The New York Times and the Wall Street Journal, meanwhile, took down their paywalls to enable people to get storm updates for free. “Run riot! Read everything!”, one Twitter user joked, although the Wall Street Journal still had its paywall up for other stories not related to the storm. One netizen on Twitter posted a link to the website of animal welfare group ASPCA, which told concerned pet owners how to prepare their animals for the upcoming storm. Smartphone users were also able to download applications to help them keep informed about the storm. The American Red Cross, for instance, provided an app giving the latest storm information, a check-list of things to have stored in the house, and even a quiz on hurricanes to while away the hours. On Facebook, meanwhile, a community page set up for the hurricane, which includes graphics illustrating Sandy’s wind speed or “threat index”, had already garnered thousands of ‘likes’. But for all the concern on social networks, many netizens also lightened the atmosphere with some humour and funny pictures. Hurricane Sandy’s target is a direct hit on Florida USA moving southwards, but due to the HAARP Project to mess with the epicentre, it is diverted northwest away from major cities to lessen the impact. (Reuters) – China has designed nuclear missiles and blasted astronauts into space, but one vital technology remains out of reach. Despite decades of research and development, China has so far failed to build a reliable, high performance jet engine. This may be about to change. China’s aviation sector is striving for a breakthrough that would end its dependence on Russian and Western power plants for military and commercial aircraft. Beijing is evaluating a 100 billion yuan ($16 billion) plan to galvanize a disjointed and under-funded engine research effort, aviation industry officials say. The giant, state-owned Aviation Industry Corporation of China (AVIC), China’s dominant military and commercial aviation contractor, has been lobbying hard for the extra money, officials familiar with the details say. AVIC, with more than 400,000 employees and 200 subsidiaries including 20 listed companies, has already set aside about 10 billion yuan of its own funds for jet engine development over the next three years. The engine financing plan is under high-level discussion in Beijing, said Zhao Yuxing, an official at the securities office of Shanghai-listed Xi’an Aero-Engine Plc, a key military engine-making unit of AVIC. “What we know is our company has been included in the strategic program, which is designed to greatly develop and support the engine industry,” he said by phone from his company’s headquarters in the northwestern city of Xi’an. China’s military industry as a whole has suffered from Tiananmen-era bans on the sale of military equipment from the United States and Europe. Moreover, foreign engine-makers have been loath to transfer technology. That has prevented China from taking its usual route to closing a technology gap: copying it. Some Chinese aviation industry specialists forecast that Beijing will eventually spend up to 300 billion yuan ($49 billion) on jet engine development over the next two decades. While AVIC’s long term priority is to develop high performance engines for military aircraft, it is also trying to design power plants for passenger aircraft in the world’s fastest growing civil aviation market. Based on projected demand from Western aircraft manufacturers, engines for new passenger aircraft delivered in China could be worth more than $100 billion over the next 20 years. For China’s aviation engineers, the traditional short cuts of extracting intellectual property from foreign joint venture partners or simply copying technology from abroad have so far delivered minimal results. Foreign engine manufacturers including General Electric, Snecma, a subsidiary of French aerospace group Safran, Rolls Royce Plc and Pratt & Whitney – a unit of United Technology Corp, jealously guard their industrial secrets, limiting the transfer of know-how and opportunities for intellectual property theft. However, China may be poised to win access to technology from an expanding range of commercial aviation joint ventures with these companies. China’s ability to develop engines for passenger aircraft could have considerable potential for technology transfer to the military, experts say. Under AVIC’s plan, fragmented engine research and development would be consolidated to minimize competition and duplication of effort. A legacy of Maoist-era dispersal of defense industries, engine research institutes and aerospace manufacturing companies are scattered about the country in cities including Shenyang, Xi’an, Shanghai, Chengdu and Anshun. AVIC plans to inject its major engine related businesses into Xi’an Aero- Engine as part of this consolidation, the listed company said in its 2011 annual report. “There is widespread consensus that engines have become a bottleneck constraining the development of China’s aviation industry,” the report said. China faces a daunting challenge. Only a handful of companies in the United States, Europe and Russia have mastered this expertise. Established manufacturers have labored on research and development since the 1950s to build safe and reliable engines with thousands of components that function under extremes of temperature and pressure. This involves state-of-the-art technologies in design, machining, casting, composite materials, exotic alloys, electronic performance monitoring and quality control. Since then, the big players have collected vast stores of performance and operational data from existing engines that gives them a head start in designing new versions with improved fuel efficiency and reliability that airlines now demand. And, for commercial engines, all of the design and manufacturing processes must be carefully coordinated and exhaustively documented to satisfy aviation certification authorities. “The reason so few can do it is because it is really, really difficult,” says Richard Margolis, a former regional director of Rolls Royce in northeast Asia. High performance military jet engines are crucial to Beijing’s long term plan to increase the number of frontline fighters and strike aircraft in its air force and naval aviation units. These aircraft are a key element of a long term military build-up aimed primarily at securing military dominance over Taiwan and a vast swathe of disputed maritime territory off China’s east and southern coasts. Due to the export bans on military equipment to China, Beijing has been forced to rely on imported fighters from Russia, reverse engineered copies of these Russian aircraft, and some home-grown designs. This strategy has delivered rapid results. Since 2000, China has added more than 500 advanced fighters and strike aircraft with capabilities thought to equal all but the most advanced U.S. stealth aircraft. At the same time, it has also sharply reduced the number of obsolete aircraft based on Soviet-era designs, military experts say. A clear example of this progress was on display recently when a Chinese-made J-15 jet fighter practiced “touch and go” circuits on China’s first aircraft carrier, the newly commissioned Liaoning. These maneuvers suggest that J-15 pilots and crews will soon master take-offs and landings from the carrier at sea. Foreign and Chinese military experts were quick to point out that the J-15, one of China’s newest military aircraft, was powered by a pair of Russian Al-31 turbofans – they power almost all of China’s frontline aircraft. Reports in the Russian media say Moscow has sold more than 1,000 engines from the A1-31 family to China with further, substantial orders in the pipeline. While Chinese engineers have been able to reverse-engineer Russian airframes, the engines have been much more difficult to copy without access to the complex manufacturing processes. AVIC subsidiary and China’s lead military jet engine maker, Shenyang Liming Aero-Engine Group Corporation, has been working on a homegrown equivalent, the WS-10 Taihang, but this power plant has so far failed to meet performance targets after testing on the J-15 and other fighters, Chinese and Western military experts say. The Chinese military is expected to introduce another 1,000 advanced fighters over the next two decades, according to Chinese defense sector analysts. However, anger over reverse engineering and wariness of China’s growing military power has made Moscow reluctant to supply engines more advanced than the Al-31. Without imported or locally built versions of these engines, China will be unable to build aircraft that could compete with the latest U.S. or Russian stealth fighters, experts say. While military jets are strategically important, the commercial market is potentially much bigger. Boeing forecasts China will need an extra 5,260 large passenger aircraft by 2031. Bombardier Inc. projects demand for business jets will reach 2,400 aircraft over the same period. With each aircraft requiring at least two engines plus spares, total demand could reach 16,000 engines with an estimated average cost of $10 million each at current prices. China plans to compete for some of these aircraft orders with two locally built passenger aircraft, the 90-seat ARJ21 regional jet and the 150-seat C919. GE will supply engines for the ARJ21. CFM International, a joint venture between GE and France’s Snecma, won the contract to develop new engines for the C919. Some of these engines will be assembled at joint ventures in China. Despite the intensified research effort and potential for technology transfer from these ventures, some experts say foreign engines will continue to rule the skies in China. “This won’t change for 10 or 15 years,” says Chang from Kanwa Asian Defence Magazine. P/S : All these are available at public domain, so there is no secrets. What is the use of an armour piecing missile? http://c.brightcove.com/services/viewer/federated_f9?isVid=1 Advances in unmanned military tools and vehicles have come on leaps and bounds, but, until now, we haven’t seen a weapon firing drone operating in the seas. A recent test taking part offshore near Maryland saw several missiles launched from a new remote-controlled inflatable-hulled ship. While the Navy has used drones before for mine clearing and other defensive tasks, the small boat (similar to that pictured above) is the first experiment to involve true offensive capabilities. The almost zodiac-like craft has been an ongoing project over recent years, and contains a fully automated system which the Navy calls a “Precision Engagement Module” which uses an Mk-49 mounting with a dual missile launcher manufactured by Rafael. The hope is that such vehicles could patrol the coastline, or serve as a first defense against pirates, and other such small, fast-moving seafaring dangers. If you want to catch it in action, head past the break for the video, but don’t be fooled. While it might look like a series of misses, the Navy claims this is just a trick of the camera angle, with all six missiles apparently making contact. Author Gilbert Tan TSPosted on October 29, 2012 Leave a comment on What is the use of an armour piecing missile? No budget to restore National Monuments? Isn’t it time to let the Church decides? Recently, while at the NTUC Income HQ to run some errands I have decided to explore the vicinity. First was a visit to the Cathedral of the Good Shepherd, bounded by the parallel Queen and Victoria Streets, and Bras Basah Road. From the signage erected at the front of the Cathedral, the Cathedral was gazetted a national monument on 6 July 1973 by the Urban Redevelopment Authority (URA). I’ve spoken to one of the helper who was busy cleaning the interior in preparation for the weekend masses on the status of the Restoration Fund. Pathetic was my conclusion. This helper shared with me that the Church of Saints Peter & Paul is also facing similar fate. The Church of Saints Peter and Paul, located at Queens Street was also gazetted a national monument on 10 February 2003. At the Cathedral of the Good Shepherd, its church restoration fund aims to restore its premises urgently as there are cracks and other structural defects in the building. This is due to Land Transport Authority (LTA) works during the construction of the Bras Basah MRT station and the Singapore Management University. Despite much of the current dilapidated state of the church building was the direct consequence LTA works, it was understood that they have not sufficiently compensated the Cathedral. The cathedral needs around S$40 million, of which S$8 million has been raised as at December 2011, according to a board tracking the fund raising progress outside the main entrance of the cathedral. The nearby Church of Saints Peter & Paul requires about of S$10 million for its restoration. Similarly, appeal for public fund is on-going. I have resided in New York, Paris, Shanghai, Hong Kong, Seoul and New Delhi during the cause of my work. What I have learnt is that when buildings in these cities are gazetted to be conserved as national monuments, its restoration and maintenance are usually funded by the State. Why isn’t the Singapore government paying for the restoration instead of passing the buck to the public? If the government is not willing to finance the restoration, why even bother to conserve these buildings in the first place? Might as well leave them to the Archdiocese to make their own decision if they want to tear down the buildings and build a totally new Cathedral or church? Restoration usually costs more than new build and far more time consuming. The Singapore government is known to have huge reserves. The state sovereign wealth funds are known to lose billions due to bad investments, politicians pay themselves million$ yet not willing to pay for the restoration to retain heritage to the city-state? All these churches at located at prime land where it is possible to get funding if the Church decides to mortgage their land to build a new building which is cheaper than restoration. If the government does not provide the funds to help in the restoration of National Monuments, isn’t it time to leave the decision to the Church to decide what to do with their old buildings? If the government wants the land, make them pay compensation so that you can relocate somewhere else with a new premises, which is likely the cause. My assessment is in a few years time when South Beach Project is launched, this area might raise to up to $3K-4K psf, so everyone is now sitting on a goldmine, use your bargaining powers to get the best deal. Now you know the real reason. You can decide to sit out until the launch of South Beach Project, by then average prices will hit $2K psf but I doubt you can be compensated at the historical high value of $4K psf. As such, you can see the present trajectory of inflation which will continue to rise and hover around 8-10% in less than 10 years time. Author Gilbert Tan TSPosted on October 29, 2012 Leave a comment on No budget to restore National Monuments? Isn’t it time to let the Church decides? In the future, you just might be charged for driving to the convenience store around the corner to get milk and bread. The government is now testing new satellite-tracking technology that could develop into the next-generation electronic road pricing (ERP) system. The System Evaluation Test (SET) began in May and “is a technological trial to help identify a technological solution most suited for Singapore”, Channel NewsAsia reported. So don’t be alarmed if you come across four black cantilevers at Woodlands Avenue 12, the site where the SET testing is being carried out. You will also notice a range of surveillance cameras, reflectors and sensors set on the structures hanging over the road. Kapsch TrafficCom, MHI Engine System Asia and NCS, ST Electronics (Info-Comm Systems) and IBM Singapore, and Watchdata Technologies and Beijing Watchdata System were awarded the tender last year to develop technologies within 18 months as a replacement for the ERP system. They were each allocated S$1 million for the project. These tests are expected to be completed at the end of the year, following which the Land Transport Authority (LTA) will “assess the performance of the various solutions to determine whether an appropriate technological solution is available and can form the basis of a next generation ERP system”, an LTA spokesperson was quoted by CNA as saying. Using the Global Positioning System (GPS) to track vehicles on the roads, this satellite tracking might replace the existing ERP system and perhaps even the annual road tax that all motorists pay regardless of usage. Another aspect of vehicle ownership that can be looked into is the Certificate of Entitlement (COE) premiums, which can be reduced if drivers are charged on their usage. I think if this satellite tracking replaces the ERP, drivers might be made to pay distance-based charges (mileage travelled), time-based charges (duration of car usage, weekdays or weekends, peak or non-peak hours), location-based charges, or even a mixture of all three, using GPS-based electronic road pricing in place of the current area-based charges. There will be no need for ERP gantries, requiring just GPS coordinates, software and cameras for monitoring. For example, a possible structure might be one where the system starts charging once you start your engine and move off, regardless of whether you are heading around the corner for your Sunday coffee, picking your kid up from school or going to work on Monday morning. Those who seldom use their vehicles will benefit from this, otherwise the possible execution of satellite tracking ERP may make the usage of vehicles more expensive in Singapore. There are no firm plans on how this vehicle satellite tracking system will be used as testing is still in progress to evaluate its viability to be used for road pricing. However, there are various possibilities on how it can be implemented for the next generation ERP system. With this ability to track vehicles, this potential system basically can serve as a 24-hour surveillance camera for all motorists in Singapore. It can detect speeding vehicles, red-light beaters, illegal parking, hit-and-run drivers, and also assist in finding stolen cars or other types of crimes. Fret not, this project is still in its early stages and there is no set date or time to introduce the next-generation ERP system yet. Reports from North Korea suggest the authorities have begun moves to end the rationing of rice and sell it on the free market. The reports, quoting diplomatic sources, say workers are being given pay increases in compensation for price rises. Correspondents say the reported changes – if confirmed – would mark a major step towards the introduction of a market economy in North Korea, one of the world’s last Communist states. North Korea has relied on rationing to feed its people for decades and has had a centrally planned economy. But workers’ wages will now be raised in line with their job performance, according to South Korea’s Yonhap news agency. The source said the developments showed “clear indications that some aspects of the market economy are gradually spreading into North Korea’s planned economy”. But another diplomatic source, who spoke to Reuters news agency, said the new system actually went into operation in June, prompting a sharp increase in wages and prices. “The rationing system will be replaced with a new economic system in which all transactions and economic activities are settled with the yuan,” he said. 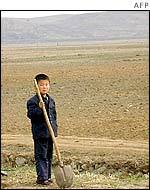 The new system would apply to all North Korean workers including labourers, farmers and bureaucrats, the source said. Food supplies have been badly affected in recent years by a series of natural disasters and the weakness of the North Korean economy. After severe famine hit the country in the mid-90s in which several hundred thousand people are said to have died, North Korea has become heavily reliant on international food aid. But a BBC correspondent in Seoul, Kevin Kim, says that recently the North’s leader, Kim Jong-il’s son, called for a new way of thinking, suggesting he was more open-minded about adopting capitalist systems in his country. The country – now with a population of 22 million people – has been Communist since 1948 when the state was founded under Kim Il-sung. North Korea‘s economy is a centrally planned system. The role of market allocation is sharply limited – mainly in the rural sector where some peasants sell produce from small private plots. Although there have been scattered and limited attempts at decentralization, as of mid-1993, Pyongyang‘s basic adherence to a rigid centrally planned economy continues, as does its reliance on fundamentally non-pecuniary incentives. Rumors of reform which surfaced in 2012 after Kim Jong-un assumed leadership appear to have been unfounded; as of Fall, 2012 interviews with North Koreans revealed changes have been only cosmetic with disorganization and corruption remaining endemic. The collapse of communist governments around the world in 1991, particularly North Korea’s principal source of support, the Soviet Union, forced the North Korean economy to realign its foreign economic relations. Economic exchanges with South Korea have begun: see Kaesong Industrial Region. With GDP per capita of less than $2,000, North Korea remains as one of the world’s poorest and least developed countries, in sharp contrast to its neighbor South Korea, which has one of the largest economies in Asia. Who will be ready to move into new markets which will help you grow your market share substantially?